The most flexible sardine run package available. Any 6 nights at the Bulls Inn Mpame from the 10th June until the 15th July 2017. Package includes 5 days at sea in search of sardine related action. 6 nights standard accommodation, breakfast, packed lunch and dinner. Mpame is about 10km south of Hole in The Wall, away from the main hubs for the Sardine Run (Port St John’s) we have a significantly increased chance of being the only boat in the area following the sardines. Arrival Durban or East London: Oceans Africa can arrange all you transfer requirements (not included) The transfer takes approx. 4 hours from East London It is best for your flight to arrives in before midday so as not to drive on the roads in the dark. 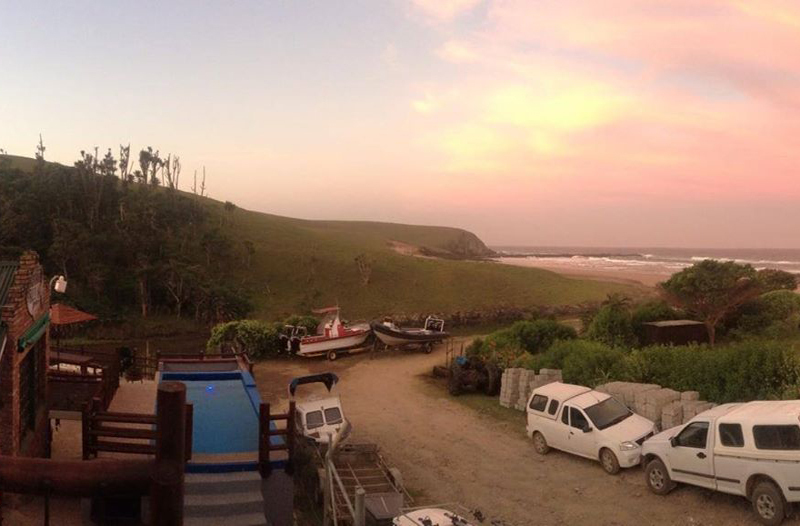 On arrival at the Bulls Inn you can settle in and enjoy a sun-downer drink and prepare your gear for the next day’s sardine run adventure. Sardine run action is often fast and furious requiring you to climb in and out of the boat many times. The boat carries enough food and refreshment to sustain you through the day. Due to the logistics of remote operation the can be no refund for any no-fly or no-launch days. Sea days lost to bad weather will not be refunded. Alternative land- based activities will be offered to clients and lost time at sea will be added to later trips where possible. Activities at Mpame: Mpame is beautifully situated. The beach is perfectly safe and great for surfing and swimming. The adjacent rocks and gullies provide great snorkeling opportunities. The Mpame estuary and river are great for canoeing and fishing. This magnificent coastal setting, and the neighboring indigenous forest a provides a haven for nature lovers, birdwatchers and photographers. The nearby hills and coastal cliffs are ideal lend themselves walks, hikes and beautiful sun-sets. Oceans Africa Diving and Whale Watching shared a post. 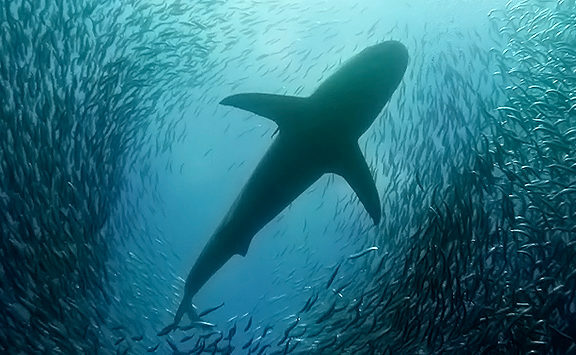 What amazing Easter weekend’s “sardine run” action was had by all involved. Although the wind was close to gale force at times and the seas big, our new catamaran, "My China", managed to handle everything that was thrown at her. 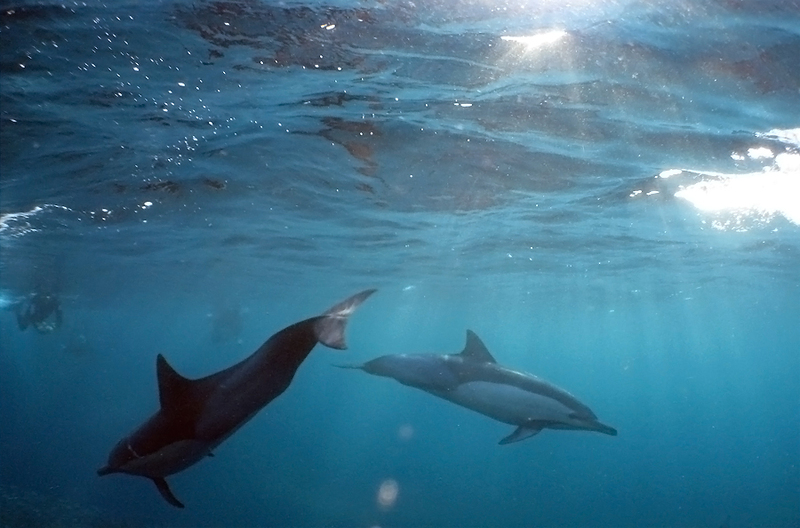 We hooked up with the same 3000 strong school of Long-beaked common dolphins every day of the long weekend. They were chasing bait fish south and east of Cape Recife, coming close enough to the shore to be observed by our PE Cetacean Spotters. Thanks guys for getting us onto the action. In the attached photos you can see the Port Elizabeth beachfront very clearly. In the first photo you will see three cow/calf pairs in the front of the photo. The calf on the left is relatively new-born, the one in the middle a much older calf and the one on the right somewhere in between. It is not often I have managed to take a photo of three calves out of the water and in such varying ages. The cows use the sardine run to wean their calves. We know this, as stranded calves have been found with both breast milk and fish in their stomachs. 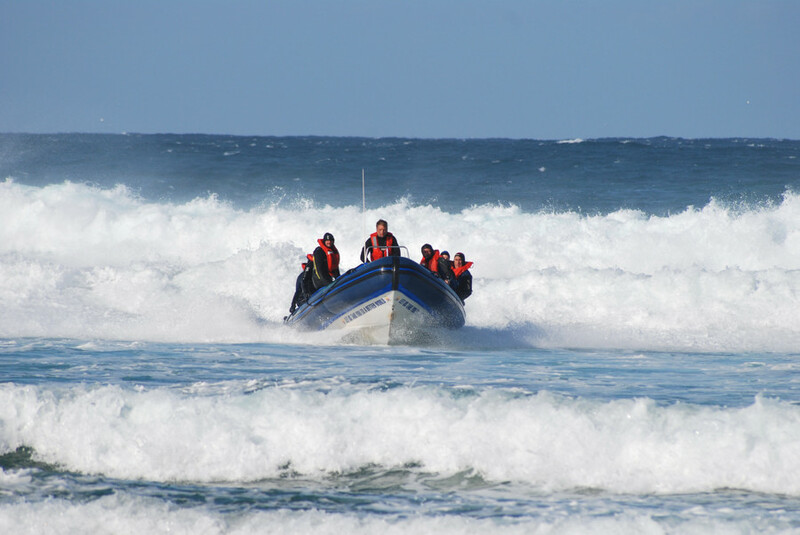 Although the “sardine run” is associated with sardines in Natal, it is not always the case here in Algoa Bay. 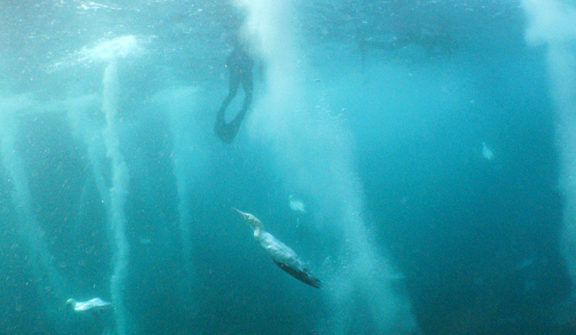 As can be seen by photo # 5, the dolphins, gannets and the odd Bryde’s whale were feeding on anchovies. This one jumped right into the boat! 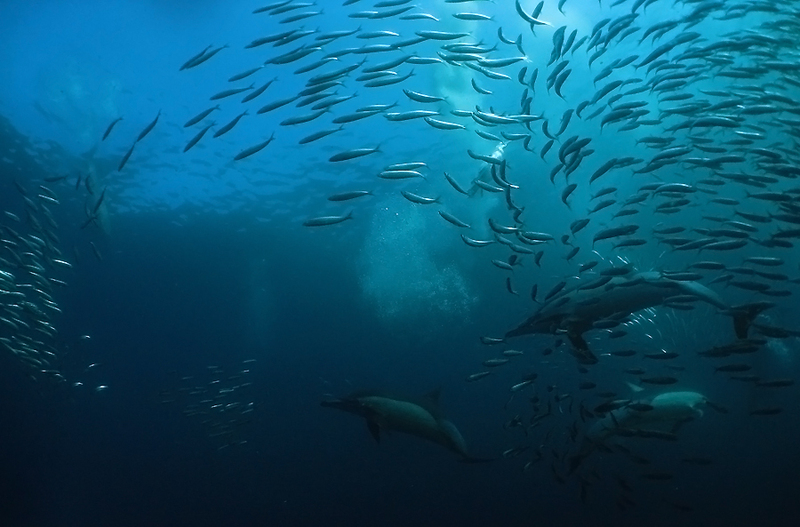 Anchovies filter feed on zooplankton and are a very important food source for many fish, birds and mammals. Adults live for three years and spawn on the Agulhas bank in summer. Some migrate up the west coast and some to the east coast. They make up the main component of the purse-seine fishery and are unfortunately turned into fish meals and fish oil. 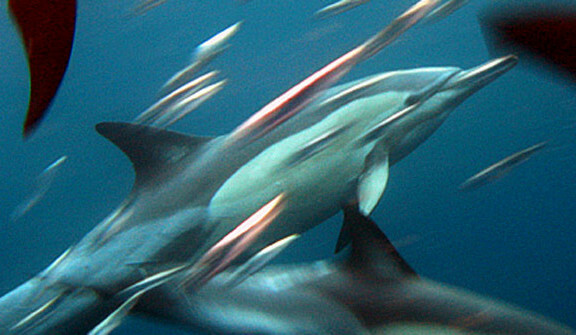 The population up the west coast has almost collapsed completely due to overfishing. Cape gannet and African penguin populations have also plummeted as a result. Will we ever learn? !